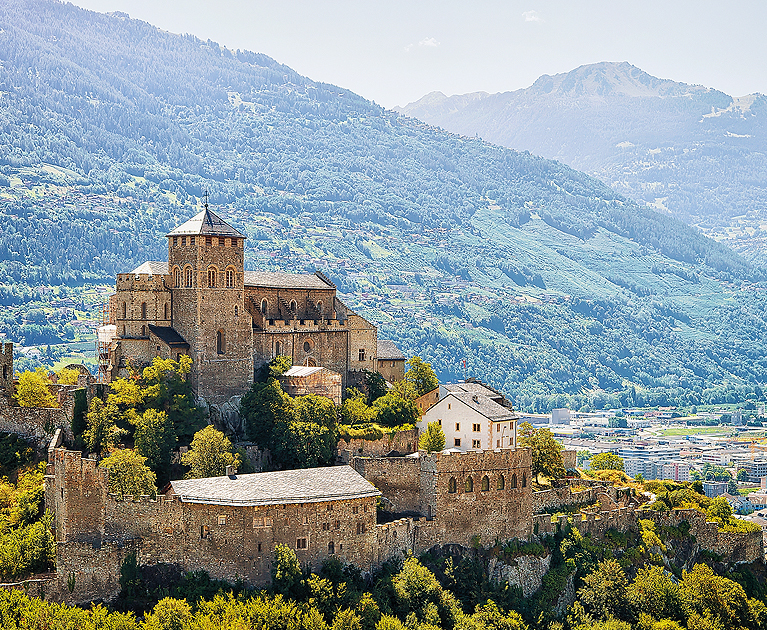 If your idea of a fairy tale involves horse-drawn carriage rides, wine tastings and plunging into the world’s best alpine landscapes, then this is the journey for you. Experience Switzerland’s storybook scenery spring to life on this intimate discovery, where you’re so close to nature that even one of your stays is literally on a lake. 27 Jul and 15 Aug 2020 departures, subject to availability. Visit the Klötzli Messerschmiede workshop and watch on as masterful artisans hand-craft Swiss folding knives, where you will gain an appreciation of the skill it takes to maintain such high standards of knife production. It’s wine time as you pause for a moment to savour a Mauler tasting, a fine cuvée that is based on traditional methods since 1829. Today is all about getting into the natural landscapes Switzerland has to offer. Head across Lake Neuchâtel to Creux du Van, a 160-metre high vertical rock than spans more than four kilometres. Its basin contains 200-million-year-old limestone deposits of a prehistoric ocean. Afterwards, enjoy your Signature Experience. Later, arrive at your hotel in Montreux. Stay: Hôtel Victoria à Glion sur Montreux, in a guaranteed Lake View Room. Should you wish to head off-piste, set out on a hike along the 5-Seenweg (Five Lakes) Trail. Follow the path along the Stellisee, Grindjisee, Grünsee, Moosjisee and Leisee lakes, where you will see the reflection of the Matterhorn in the shimmering waters – the perfect photo opportunity. 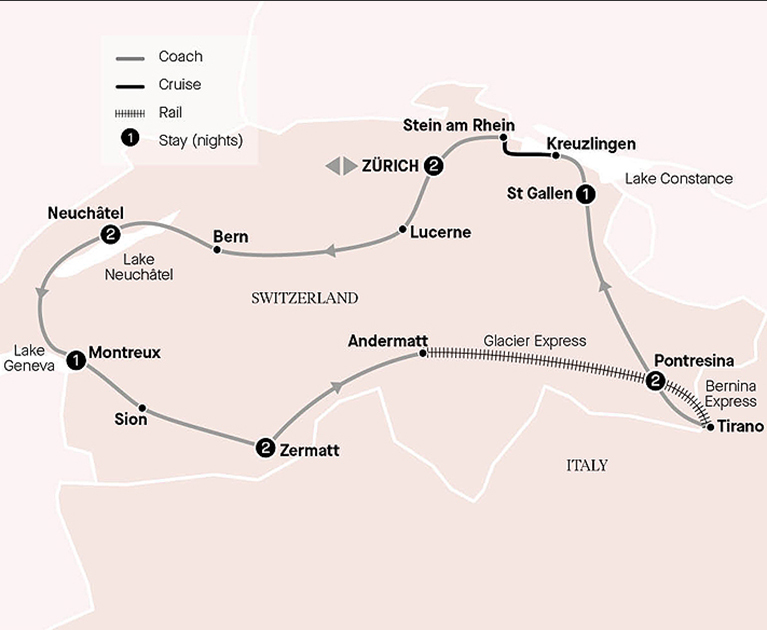 Otherwise head to the village centre, where you will soar to new heights as you board a train to Gornergrat, ascending 3,089 metres in just 33 minutes. At the peak, the views will leave you spellbound. In the Roseg Valley, sit back and relax, while a horse-drawn carriage takes you on a leisurely journey through stunning scenery. This is what fairytales are made of. The fairytale has come to an end. Farewell, your tour director and new-found friends after breakfast, then be transferred to the airport for your onward flight. Advertised prices are person twin share, land only, correct at time of publication and are subject to availability and change at any time without notification due to fluctuations in charges, taxes and currency. Offers valid on new bookings only. Bonuses are included in the advertised price. A first non-refundable deposit of $1,000 pp is due within seven days of booking. Final payment due 100 days prior to departure.¹Air credit: Offer is not redeemable for cash and is not transferable. ^Deposit Cancellation Cover is valued at $95 per person. Cancellation can be up to 100 days prior to the tour departure and deposit will be retained as an ATG holding credit to be used for future bookings for up to 3 years. If deposit cancellation cover is claimed, monies held must be used on a future cruise or tour and cannot be redeemed against the original cruise or tour departure date. Deposit held in credit will exclude fees imposed by third parties in relation to – air and rail travel, hotels and cabins on Voyages cruises. When booking airfares through ATG (including when taking advantage of a special offer that includes air travel), standard airline cancellation fees will apply. In some cases, airfares will be non-refundable. In the event of cancellation, these fees will be deducted from the deposit paid, and therefore the credit being held. ATG Deposit Cancellation Peace of Mind applies to new bookings only and is only valid up until 100 days prior to travel. Other conditions apply. Please contact your personal travel manager for full terms and conditions.